Palookaville is a fascinating source of insight into the work of an excellent and ambitious cartoonist. 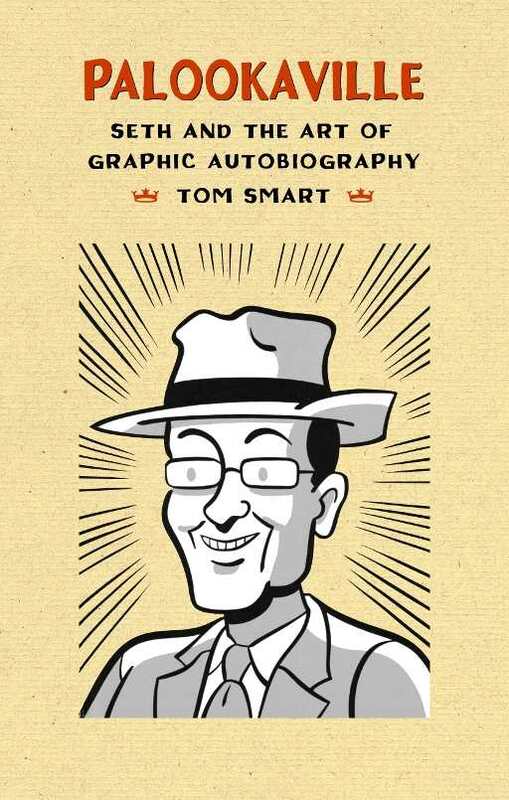 Tom Smart turns his trained eye to the art and worldview of Canadian cartoonist and graphic novelist Seth in the meticulous analysis Palookaville: Seth and the Art of Graphic Autobiography. Seth (the pen name of Gregory Gallant) has been the subject of a documentary, designed The Complete Peanuts series by Fantagraphics, provided images for Lemony Snicket’s books, and has had his work featured in The New York Times Magazine and on the cover of The New Yorker. Despite his professional success, the artist himself is something of an enigma—dressing in suits and hats from the 1950s and disdaining most cultural inventions past that time. As Smart writes, “Seth can … be described as a sophisticated performance artist who cloaks his artistic practice in the garment of a cartoonist and illustrator.” Palookaville examines the man and his work, and the often-thin membrane that seems to separate the two. The book’s title, Palookaville, comes from Seth’s ongoing comic book series of the same name, and the term “palooka” was popularized by its use in a 1930s American comic strip. This term is, in its way, representative of Seth’s preferred vision of life—one from the twentieth century, not the twenty-first—but also of his method. Seth is profoundly influenced by his love and study of American and European cartoonists who came before him. Like the visible tip of an iceberg mostly hidden by water, what Seth produces on a page is intimately connected to his love for the work of these artists, as Smart explains. Smart also probes Seth’s deceptively simple-looking work, and the subtle and complicated shades of life they reflect. Seth’s complete stories, including It’s a Good Life, If You Don’t Weaken, and stories in progress, notably Clyde Fans, are held under a microscope, revealing the details used to convey emotion or character in each, and how they reflect the biography or philosophy of Seth. Some questions remain frustratingly unanswered: for example, Smart posits the idea that Seth himself may have authored several of the letters from fans posted in issues of the Palookaville series. He notes that Seth has denied these claims, but instead of a direct quote, it’s attributed in a footnote, without further comment: “Email to author, January 6, 2016.” It would have been more interesting to read Seth’s reply verbatim, and at times it’s frustrating that Smart is unable to simply have his subject clarify certain aspects of his own work. It must be assumed that this is because of reluctance on the part of Seth, not Smart, because Smart seems to make every effort to fill in the blanks using his own devices. Thus, Smart writes lines like “Seth has never been explicit about why he chose such a name [Palookaville] for his comic book,” and he valiantly theorizes about the origins of the pen name Seth. Despite the drawbacks of such an arm’s-length examination, Palookaville is a fascinating source of insight into the work of an excellent and ambitious cartoonist, who stands with the leaders of the genre in finding ways to utilize its full potential.